Newcomer O'Brien finds himself in a movie starring his idol Jack Slater, the kind of guy who never loses a fight and is impervious to gunfire and explosions (and he has a really cool car and a really big gun). Disappointing action/spoof of movies within a movie (rumored to have cost $80 million) was critically maimed and never recovered. The concept isn't new and has been done better before, though Ah-nold possesses his usual self-mocking charm, which is more than can be said for the movie. Look for lots of big stars in small roles and cameos. Cluttered with inside Hollywood gags, the script was given uncredited assistance from William Goldman. 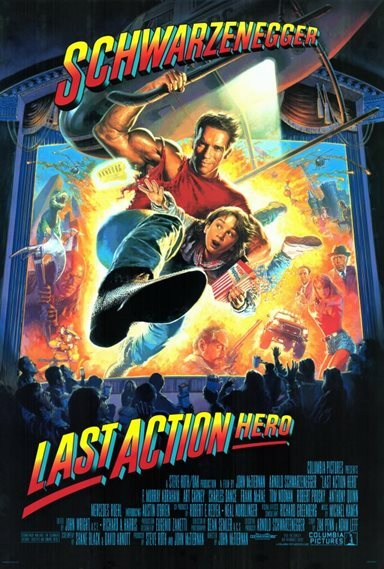 Download Last Action Hero in Digital HD from the iTunes store. Last Action Hero images are © Columbia Pictures. All Rights Reserved.